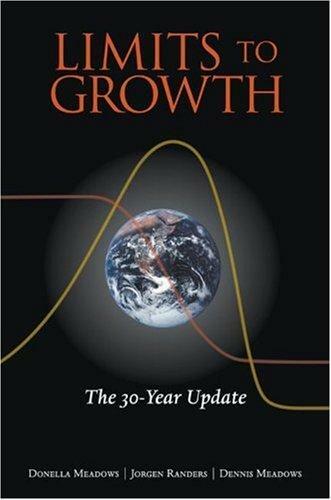 If I could recommend just one book to someone with a business-as-usual outlook, someone who believes human ingenuity and free markets will always bail us out of any resource scarcity or environmental problem, it would be Limits to Growth: The 30-Year Update (henceforth LTG). After reading it, you may never look at the world in quite the same way again. This post contains a summary, but I really do recommend you go and read it all. It is well argued, eminently readable, and pertains to issues central to our common future. Summary: wiki; synopsis; WSJ story. The first book was published in 1972, commissioned by a circle of statesmen, businesspeople, and scientists called the Club of Rome. The LTG models, using the latest advances in systems theory and computer modeling, suggested that business-as-usual economic growth on a finite planet would eventually lead to stagnating and then falling living standards, as ever more industrial capital has to be diverted towards mitigating the consequences of growth, e.g. soil degradation, resource depletion, and runaway pollution. Cornucopians and establishment “experts” have tried to discredit LTG by claiming that its predictions of global apocalypse failed to materialize; instead, hasn’t the world seen remarkable economic growth since 1972? These criticisms are unfounded. First, the LTG modelers did not make any concrete forecasts, but merely a range of scenarios based on varying initial conditions (e.g. global resource endowments) and future political choices. 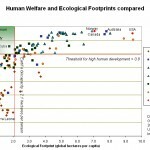 Not all the scenarios led to collapse – a reasonable global standard of living is preserved under scenarios in which humanity makes a transition back below the limits towards sustainable development. Second, none of those scenarios projected a collapse before 2015 at the earliest, so the claim is invalidated even if you treat the worst case scenario as a prediction. As such, we can only conclude that these critics are either liers or haven’t actually read the book. In this 30-year update, the authors note that their more pessimistic conclusions are already coming true – for instance, in per capita terms, global grain production peaked in 1984 and the marine catch reached an all-time high in 1988. Both have been on a slow, downward plateau since. (This finally culminated in the global foot riots of 2008 and rising “food protectionism” on the part of agricultural net exporters). 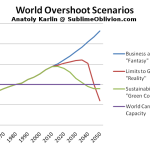 Contrary to the hype surrounding globalization, the “new economy”, the flat world, etc, global GDP growth rates peaked in the 1960’s, and have since settled down to a lower level practically everywhere outside emerging Asia (and they may yet go into outright stagnation in the 2010’s due to the convergence of peak oil, geopolitical stresses, and the decline of the West). Furthermore, this slowdown was accompanied by rising inequality, between and within countries. 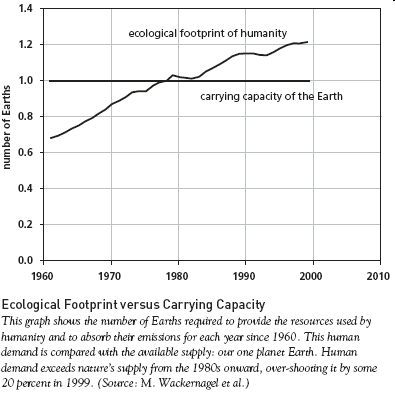 Overall, the authors believe that humanity’s ecological footprint overtook the carrying capacity of the Earth sometime around 1980, ushering in “overshoot”. A few things we should note before going further. LTG is not about particular phenomena, such as peak oil – though in itself very important, it is but a symptom of much deeper, underlying trends (the limits to growth). Second, the models indicate that growth will only begin to really falter once the system is in severe overshoot, so for the 1970-2010 period the LTG authors did not expect any major divergence between the unending growth predicted by neo-classical macroeconomics, and their own biophysical / systems dynamics models which account for the vital role of energy and ecological factors to sustaining growth. As the authors note, “we must all wait another decade for conclusive evidence about who has the better understanding” (and so far the economists are off to a bad start). The human population naturally exhibits exponential growth. Whenever total fertility rates are substantially above the 2.1 children per woman needed for simple population replacement, the population will usually grow very rapidly. In Malthusian, pre-industrial societies, this population growth typically exceeded the rate of growth of the carrying capacity; when the two drew level, population growth ceased as lower wages, elite predation, and food dearth raised mortality rates and lowered fertility rates. This increasing brittleness of the system, which made it vulnerable to shocks like poor harvests or peasant uprisings, is the single most convincing explanation for the cyclical emergence and collapse of empires. In modern industrial societies, the effects of exponential population growth are modulated by the demographic transition, the tendency for fertily rates to transition to or below population replacement rates with increasing wealth. However, the effects of these gains on reducing the human impact on the environment is more than balanced out by the growth of the stock of industrial capital. This growth is inherently exponential, because the machine tool building sector that constitutes the base of the industrial ecosystem essentially reproduces itself, i.e. you need machines to build more machines. 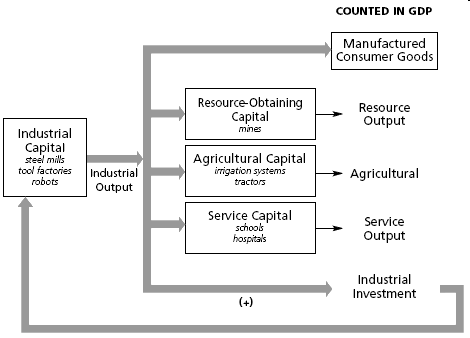 Labor and capital factor inputs, in their turn, are the motors of exponential growth in all other spheres of the human economy – food production, goods production, resource extraction, pollution emissions, services provision, etc. 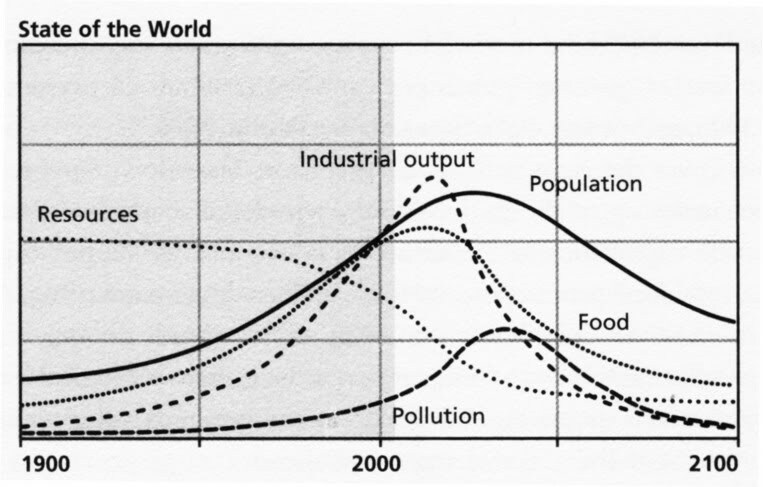 Therefore, population and industrial capital can be said to have “an inherent system structure to produce the behavior of exponential growth”, which in turn drive increases in the food, energy, goods, and services needed to sustain that same growing population and industrial system. This increases the system’s level of physical throughput, the “continuous flows of energy and materials needed to keep people, cars, houses, and factories functioning”. However, both the materials-providing planetary sources (hydrocarbons, metals, minerals, etc) and the pollution-absorbing planetary sinks (soils, oceans, air, etc) needed to sustain a certain level of physical throughput are limited (the former can be depleted, the latter can be overfilled). There are hard planetary limits to the “rate at which humanity can extract resources (crops, grass, wood, fish) and emit wastes (greenhouse gases, toxic substances) without exceeding the productive or absorptive capacities of the world”. Once those limits are breached, development becomes unsustainable and we enter a state of overshoot. To overshoot means to go too far, to grow so large so quickly that limits are exceeded. 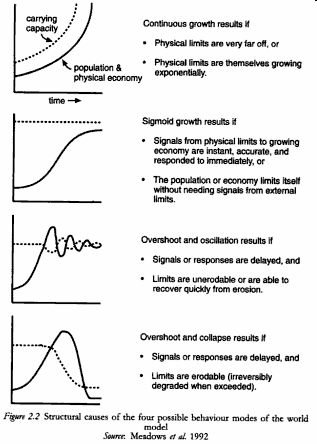 When an overshoot occurs, it induces stresses that begin to slow and stop growth. The three causes of overshoot are always the same, at any scale from personal to planetary. First, there is growth, acceleration, rapid change. Second, there is some form of limit or barrier, beyond which the moving system may not safely go. Third, there is a delay or mistake in the perceptions and the responses that try to keep the system within its limits. The delays can arise from inattention, faulty data, a false theory about how the system responds, deliberate efforts to mislead, or from momentum that prevents the system from being stopped quickly. Although the planetary sources usually appear large on paper, only a small fraction of them tend to be economically recoverable due to the law of diminishing returns. All the low-hanging fruit are picked first, such as “supergiant” oil fields, rich copper ore deposits, etc, or in other words energy sources with high energy return on energy invested (EROEI), thus leaving only remoter, deeper and more dilute resources such as polar oil, unconventional liquids, etc. Their extraction costs soar exponentially and requisition an ever greater share of the industrial base, leaving less room for consumer products (vital for political stability), the agricultural base (to prevent starvation), investment in capital stock renewal (to prevent the depreciation of the industrial base), and environmental mitigation (to prevent runaway pollution from wrecking other sectors). Below are four examples of these phenomena in action. An example of diminishing returns / lowest fruit being picked first. 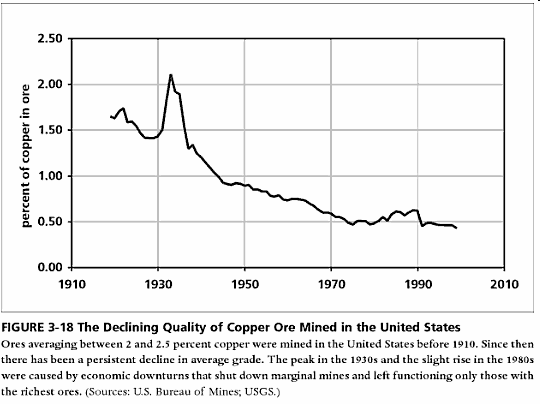 The quality of copper ore being mined is falling, and more and more energy needs to be expended to get the same quantity of copper. Eventually, the returns may become so low that mining it will no longer be at all profitable, at which point the system collapses to a lower level of complexity and salvage becomes an attrative strategy. PS. Note the counter-intuitive spike in the early 1930’s, correlating to the Great Depression. Economic retreat forces the shutdown of the least efficient mines, because the efforts they have to expend on extraction now surpass what they get back in profits. Unless the state takes increasingly coercive measure to maintain physical output at all costs, requisitioning labor and capital in a last-ditch Stakhanovite effort to prolong industrialism in a game of “last man standing”, the end of the industrial age will see the same general pattern. 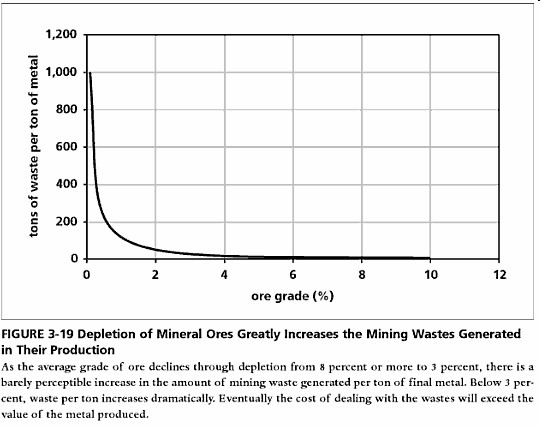 As the ore grade falls, more and more material has to be extracted and processed to get the same amount of copper. This naturally results in soaring pollution emissions, which will put increasing stress on regional and global biocapacity. 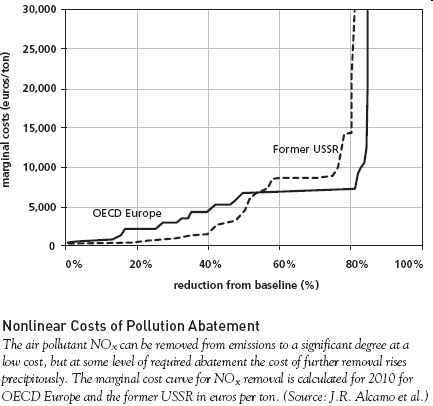 An explanation for the drastic improvements in air quality, river health, fuel economy, etc, in advanced industrial nations in the 1970’s-1980’s – picking the lowest-hanging fruit is pretty cheap. But beyond a certain point, reducing pollution becomes without a direct fall in physical output becomes prohibitively expensive. 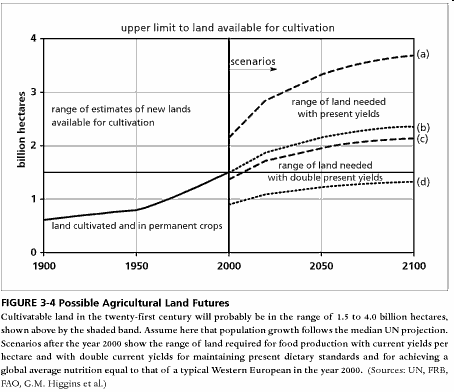 One more example of limits (the main ones, resource depletion and CO2 pollution, are covered elsewhere in this blog) – arable land availability. The amount of land devoted to agriculture has remained constant in recent decades, though its quality has decreased as good land becomes exhausted and more marginal lands were brought into exploitation. Crop yields have risen and continue to rise, but 1) they are overly dependent on the intensification of farming, e.g. using (natural-gas dependent) fertilizers that mask the decline in natural soil fertility and 2) as noted above, they have not kept up with population growth since the 1980’s. The graph shows possible food futures: if no more land is lost and crop yields double, then the world’s 8bn people can be fed on a comfortable West European diet. If on the other hand “erosion, climate change, costly fossil fuels, falling water tables… reduce yields from present levels”, then there will be a global Malthusian crisis. Possible solutions: “farming methods that conserve and enhance soil – such as terracing, contour plowing, composting, cover cropping, polyculture, and crop rotation”, and in the tropics, “alley cropping and agroforestry” – all methods that achieve high yields, improve the soil, and don’t require prodigious fossil fuel and fertilizer inputs. Basically, LTG gives one a valuable sense of how interconnected all these global systems are, about just how universal the law of diminishing returns is, and how the failure to move decisively towards a sustainable economy now will lead to collapse further down the road (and the later we postpone this transition, the greater will be the eventual collision). The most important thing is to make the human industrial ecosystem a closed loop, in which population ceases to grow, and a recycling sector feeds back wastes as inputs into the system instead of continuing drawdown to maintain an unsustainably-high “phantom” carrying capacity. 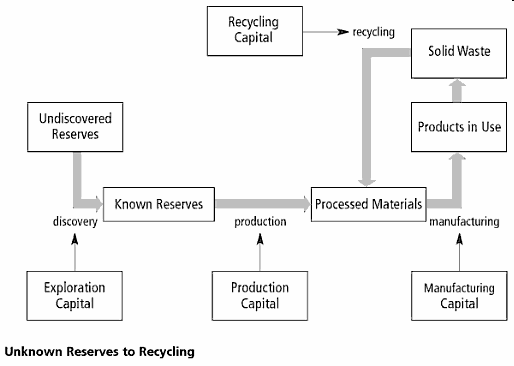 Why recycling matters: “undiscovered reserves” (sources) and the sinks for “solid waste” are both limited; hence, a high standard of living can only be preserved by 1) redirecting most wastes back within the loop and 2) directly reducing material throughput by technological innovation (energy efficiency, ecotechnology, informatics). All of these are feedback loops that I’ve described form the basis of the World3 computer models that the LTG authors used in making their scenarios. They are reproduced below, in concise detail. 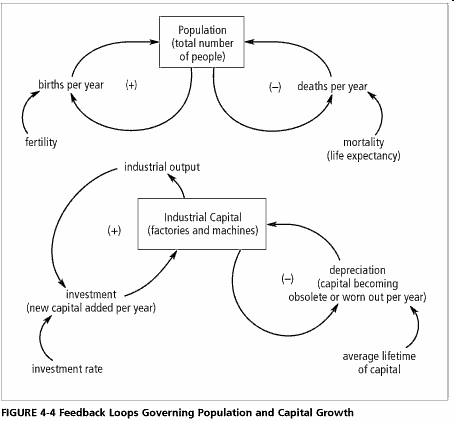 The central feedback loops of the World3 model govern the growth of population and of industrial capital. Two positive feedback loops involving births and investment generate the exponential growth behavior of population and capital. The two negative feedback loops involving deaths and depreciation tend to regulate this exponential growth. The relative strengths of the various loops depend on many other factors in the system. 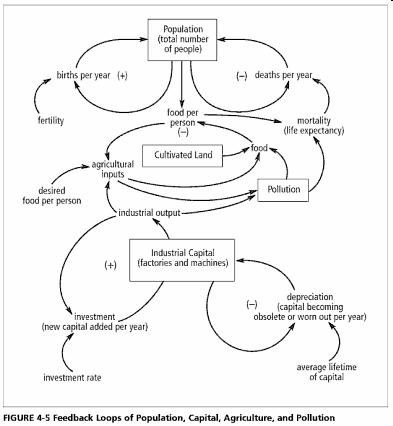 Some of the interconnections between population and industrial capital operate through agricultural capital, cultivated land, and pollution. Each arrow indicates a casual relationship, which may be immediate or delayed, large or small, positive or negative, depending on the assumptions included in each model run. Population and industrial capital are also influenced by the levels of service capital (such as health and education services) and of non-renewable resources. The “initial conditions” and assumptions are overall rather optimistic, for instance, the ones dealing with the power of the environment to clean up toxic pollution. The model leaves out corruption, military expenditures, wars and political disruptions – although vital, they are too hard to model with any degree of rigor (I write about these in my posts on Collapse Ethics and Ecotechnic Dictatorship). Chronic food and energy shortages will lead to civil unrest and political instability, necessitating greater expenditures on law enforcement and assorted populist gimmicks (e.g. the tinpot dictatorships that will rise up in the pre-Collapse period), taking away industrial capital and managerial resources from the industrial base, agriculture, and other critical sectors. Statistical bodies will manipulate inflation and GDP growth figures to preserve an image of stability, even as creeping normalcy converges to an ever darker reality. There will be a scramble to secure the world’s remaining sources of high-density resources, which will lead to a greater share of the industrial base being devoted to (unproductive) military production. Elites will mobilize support for permanent war and surveillance by citing the moral imperative of fighting freedom-hating terrorists, evil empires, and/or maintaining global peace, security and stability. And so on. Basically, by excluding these political and geopolitical variables, the World3 model presents the uppermost possibilities for the “real” world, even in the standard run which leads to collapse. This standard run is reproduced below. As you can see, it leads to overshoot and collapse. Why? Because signals and responses to problems are delayed, and limits are erodable. Examples of erosion – 1) as hunger returns, resources are concentrated into intensifying agricultural exploitation at the cost of preserving longterm soil fertility, 2) as more industrial capital is needed to maintain a certain level of resource extraction, pollution abatement, and agricultural production, less is left over to counteract the depreciation of the industrial capital stock, which begins to wither away, 3) worst of all, increasing pollution can erode the pollution absorption mechanisms themselves, thus increasing the rate of pollution buildup – this is already evident in the reduced ability of the biosphere (forests, oceans, etc) to soak up human carbon emissions. Primary Physical Symptoms – Resource stocks fall, and wastes and pollution accumulate. 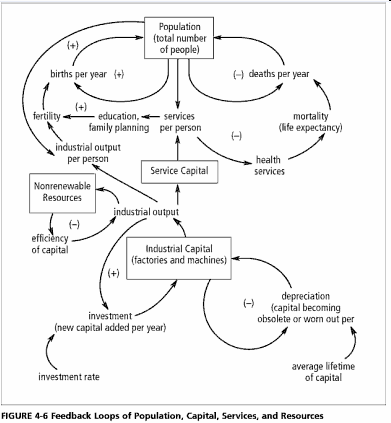 Capital, resources, and labor diverted to activities compensating for the loss of services that were formerly provided without cost by nature (for example, sewage treatment, air purification, water purification, flood control, pest control, restoration of soil nutrients, pollination, or the preservation of species) – AK: In the worst case scenario, geoengineering would mean that the most basic function previously performed by Gaia, maintaining planetary homeostasis, becomes a human responsibility. Technologies invented to make use of lower-quality, smaller, more dispersed, less valuable resources, because the higher-value ones are gone. – AK: See greentech (greenwash? ), the “hydrogen economy”, electric batteries, etc. Failing natural pollution cleanup mechanisms; rising levels of pollution. – AK: See climate change. Resulting Physical Symptoms – As resource stocks fall and wastes accumulate the behavior of natural systems may change with consequences for ecosystems and human communities. Growing chaos in natural systems, with “natural” disasters more frequent and more severe because of less resilience in the environmental system. – AK: More heatwaves, droughts, hurricanes, etc, are already observed. Resulting Social Symptoms – Society tries to live with, compensate for, and adapt to the primary physical symptoms (note: these symptoms do not include responses that address the decline of the resource base in the first place, such responses are catalogued in Signs of Life Within Limits). Capital depreciation exceeding investment, and maintenance deferred, so there is deterioration in capital stocks, especially long-lived infrastructure. – AK: See US infrastructure problems, paralleling that of the late Soviet Union. Growing demands for capital, resources, and labor used by the military or industry to gain access to, secure, and defend resources that are increasingly concentrated in fewer, more remote, or increasingly hostile regions. – AK: See resource wars, of which Iraq 2003 is one of the first in a long series to come; the US, China, and Russia have all ramped up military spending since about 2000. Investment in human resources (education, health care, shelter) postponed in order to meet immediate consumption, investment, or security needs, or to pay debts. – AK: We’ll see plenty of that in the next few years as Western states fall into insolvency like dominoes. Debts a rising percentage of annual real output. – AK: Debt levels have exploded throughout the developed world since 2000, and went into overdrive following the 2008 economic crisis & bailouts of politically-connected corporate groups. Eroding goals for health and environment. 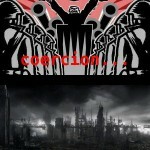 Increasing conflicts, especially conflicts over sources or sinks. – AK: Conflicts over sources = resource wars (see above), over sinks = “ecological warfare” (PLA colonels Qiao Liang and Wang Xiangsui wrote about this in their prophetic book on Unrestricted Warfare). Shifting consumption patterns as the population can no longer pay the price of what it really wants and, instead, purchases what it can afford. – AK: That is basically another way of saying people will become poorer. Declining respect for the instruments of collective government as they are used increasingly by the elites to preserve or increase their share of a declining resource base. – AK: Predatory elites always become a heavy burden on the peasantry and middle classes during times of imminent Malthusian dearth. Applied to the modern world, see the rise of the “surveillance state”, the emphasis on waging a (by definition endless) “war on terror”, the creeping militarization of internal security forces, universal databases, etc… Meanwhile, internal inequality has risen in every major region of the world – the US, Eastern Europe, Japan, China, India, etc – since 1970. Do you observe any of these symptoms in your “real world?” If you do, you should suspect that your society is in advanced stages of overshoot. Finally, here are the central assumptions in World3 that give it the tendency to overshoot and collapse: 1) growth in the physical economy is considered desirable and central to our socio-political systems; this growth tends to be exponential, 2) there are “physical limits to the sources of materials and energy that sustain the population and economy, and there are limits to the sinks that absorb the waste products of human activity”, 3) the world system receives signals about these physical limits that are “distorted, noisy, delayed, confused, or denied”, and responses are hence delayed and non-optimal, and 4) the “system’s limits are not only finite, but erodable when they are overstressed or overused”, and furthermore, there are “thresholds beyond which damage rises quickly and can become irreversible” (e.g. see tipping points in climate change). The authors note that if you want to refute LTG, you will have to show that one of the statements above is invalid. Markets and Technology to the Rescue? Maybe not. Here are three explanations. First from one of my older posts. The criticisms from markets and technology also fall flat on their faces. Markets are implicitly modeled in World3 as resource allocations are typically automatically transferred to the sector of most pressing need. (Actually, if anything the models are more market-driven than our own world, since we don’t have perfect information and instant responses in the real world, as opposed to the model). As for technology, unless concrete steps are taken to reduce material throughput, improvements are simply soaked up by the Jevons paradox. Unless technological progress is extremely rapid (e.g. as envisioned by singularitarians), there will sometime come a tipping point when efficiency improvements no longer make up for decling agricultural and resource yields and soaring pollution, and world population and human welfare collapse. Second from Limits to Growth synopsis. The most common criticisms of the original World3 model were that it underestimated the power of technology and that it did not represent adequately the adaptive resilience of the free market. Impressive —and even sufficient— technological advance is conceivable, but only as a consequence of determined societal decisions and willingness to follow up such decisions with action and money. One reason technology and markets are unlikely to prevent over shoot and collapse is that technology and markets are merely tools to serve goals of society as a whole. If society’s implicit goals are to exploit nature, enrich the elites, and ignore the long term, then society will develop technologies and markets that destroy the environment, widen the gap between rich and poor, and optimize for short‑term gain. In short, society develops technologies and markets that hasten a collapse instead of preventing it. Third from my post on ecotechnic dictatorship to criticize the technology element of Korotayev’s cliodynamics model, but which happens to apply somewhat to LTG as well. However, a closer examination shows that 1) their models of technological growth are flawed – they do not account for the diminishing returns seen for technological progress in recent decades, nor 2) do they note that in most cases post-industrial technology has not been in the form of low-maintenance knowledge, but embodied in the (fossil fuel-dependent) machines of industrial civilization. I.e., 1) to get technological growth, you have to divert resources from industrial capital and services to sustain it, 2) many spheres of technological growth themselves show diminishing returns on investment, e.g. electricity-generating turbine efficiency has more or less plateaued, electric batteries are showing signs of plateauing, etc, 3) a lot of the technology we did create in the fossil fuel age is not even at all suitable for sustainable development and are thus essentially worse than useless, i.e. only ecotechnologies can be sustainably supported, and 4) technology requires a electro-industrial base for its very sustenance: if the latter gives way, so will technology, and we will see a collapse in spheres like energy efficiency, made even worse by the fact that the available energy sources would be increasingly depleted and low-EROEI. Conclusion. Since technology itself relies on a material base for its sustenance, which in turn requires energy inputs to sustain itself. Thus, it will probably be one of the first things to be downsized when physical limits start pressing down on the economy. The hen that lays the golden eggs will probably be the first to get cooked. Second, there may be sudden and catastrophic increases in pollution. Climate change may be abrupt and catastrophic. A collapse of the West Antarctic ice sheet would raise sea levels by several meters and wipe the world’s ports and more importantly, much of its prime agricultural land. The Amazon is increasingly vulnerable to a conflagration that will turn it into desert, releasing more CO2 than I care to look up in the scientific literature. Increasing temperatures may unleash uncontrolled methane emissions from melting Siberian permafrost and oceanic clathrates. Past the point of irreversible decline a controlled retreat to sustainability becomes ever more and more unlikely, because of a) the inertia of past pollution emissions and capital investments, b) political crisis in a society predicated on permanent growth will lead to short-term thinking and ever more exclusively stopgap solutions and c) eventually institutional collapse will make it impossible to fund and implement new energy-efficiency or pollution-control technologies on any sufficiently large scale or even maintain already existing infrastructure devoted for those purposes. A Comparison of `The Limits to Growth` with Thirty Years of Reality (Graham Turner) – It adds up. Peak Oil and “The Limits to Growth”: two parallel stories (Ugo Bardi) – explores the parallels. A New World Model Including Energy and Climate Change Data (Dolores García) – model run incorporating more detail on climate change in particular on Vensim, conclusion: “if the world continues behaving as we have so far, decline is inevitable in the long run”. New World Model – EROEI issues (Dolores García) – explains how to incorporate EROEI with the World3 model, update of above post. Mind-sized Hubbert (Ugo Bardi) – LTG without too many graphs. Qu’y a-t-il donc dans le “Rapport du Club de Rome” ? – synopsis of LTG and World3 for Francophones.